Threshold mosaics were common in shops in the early-20th century. 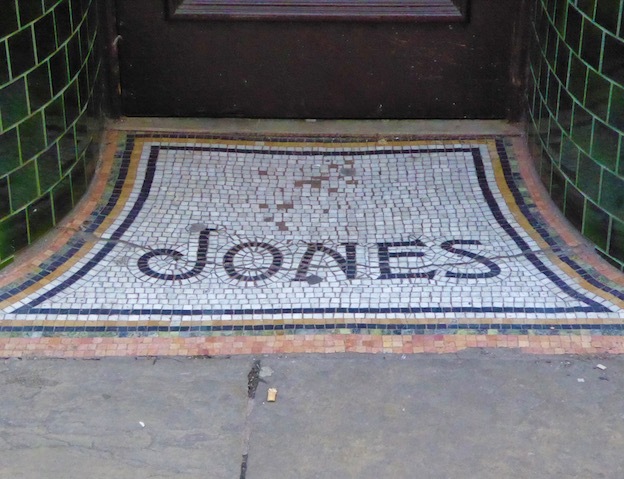 These shops often had a doorway recessed in a small lobby, and the mosaic on the floor was a way of reinforcing the owner’s identity – another kind of advertising, if you like, to add to the name on the shopfront and the display in the window. Now customers and passers-by can enjoy them as charming bits of craftsmanship or as useful historical clues to the past owners of shop premises. I have to say, though, that I don’t know who the Jones was who had this shop in the centre of Hereford. He or she* has long gone, but their mosaic remains, framed by the rich green tiles of the curving stall risers on either side. The mosaic isn’t in the best condition – it’s a shame about that crack, and the missing tesserae† – and perhaps the person who made it wasn’t the most accomplished mosaicist: I’ve seen other examples where all the ‘blank’ tesserae are laid in staggered courses, like a perfect brick bond. But there’s still much to enjoy, from the multicoloured border to the stylish lettering. Regular readers of this blog will not be surprised that it’s the lettering that caught my attention.¶ The N, with its curving cross-stroke, and the very curly J are my favourites. To create these, with tiny bits of stone or tile, would have taken plenty of art and effort, as did the serifs present on some letters, and as did the outline tesserae – look at the way the black line of the O is followed by the white pieces that surround it. If threshold mosaics like this are modest compared to the work of master artists like Boris Anrep and the mosaicists with whom he worked, they still show their share of flair. They deserve to be noticed as we step over them or walk past, as reminders of a time when shopkeepers built their names into their premises in the hope that their businesses and their reputations would prosper and endure through the generations. * Probably a he, but businesswomen’s names are sometimes concealed behind the gender-neutral initials of a shop sign. Did you know that the H. Samuel of the famous jewellery chain was a woman? † Tesserae: the small individual pieces of stone or other material that make up a mosaic. ¶ Am I predictable, or am I predictable? 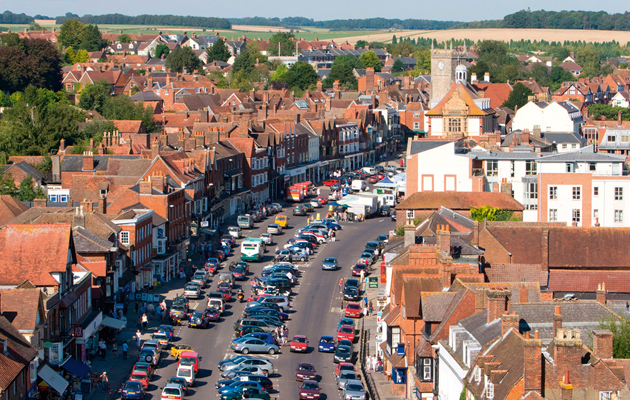 Marlborough is one of the English towns (Blandford Forum and Warwick are others) whose history was changed by a great fire. Marlborough’s major fire occurred in 1653 and there were further fires in the late-17th century. Substantial rebuilding in the late-17th and early-18th centuries has left the centre of the town with its own distinctive appearance – the High Street displays a unified townscape of red tiled roofs, gables facing the street, tile-hung walls, bay windows, and arcaded ground floors. * It’s not all like this – there are also a few white and black-and-white facades – but there’s enough of it to set a dominant and satisfying style. The most unusual and outstanding aspect of this is the arcading. There are a few English towns that have substantial runs of arcading in main streets, and they vary quite a lot in design. At Totnes, the upper storeys of the buildings overhang the walks beneath, so that the columns are flush with the upper part of the facades. At Tunbridge Wells, the famous ‘Pantiles’ have arcades that protrude forwards from the building line, so that they cover the pavements at ground level and house balconies above. And in the case of Chester’s ‘Rows’, the arcades are upstairs, on the first floor. 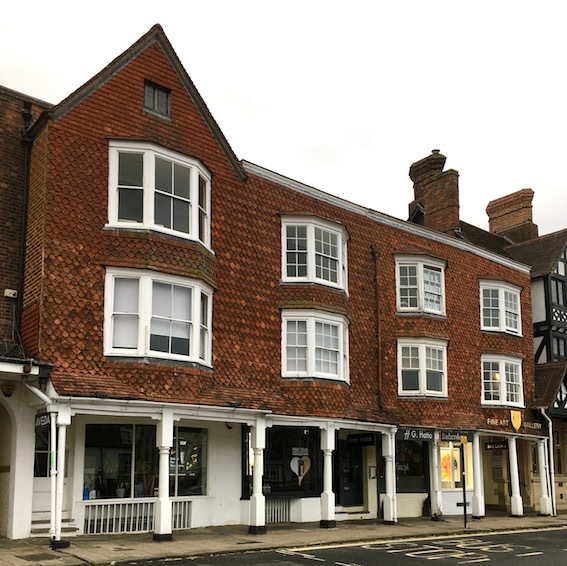 Marlborough’s arcades break forward slightly from overhanging upper storeys, so that they cover only part of the pavement. They are topped not with balconies, as at Tunbridge Wells, but with narrow pitched roofs. These are covered with tiles that match in colour the clay tiles with which the walls above are hung, giving a pleasantly ruddy colour to the facades. Many, but not all, the tiles have a ‘fish-scale’ pattern, so they also have an attractive texture. Very broad, long, and curving slightly, this is one of the country’s notable streets, a wonderful setting for the market, for shopping, or for an evening stroll. It’s not always easy to see it as a whole, because it’s so long, and it’s often full of market stalls or parked cars. An aerial view gives one a clearer idea; a closer view reveals its colourful effect and distinctive texture. *Tile-hanging is a speciality in the southeast, in Sussex and Kent especially. But you also find tile-hung walls in other places, such as parts of Buckinghamshire, and in Wiltshire in Marlborough and some of the nearby villages. Here’s one last piece of outstanding tiling from my recent visit to Poole, and in many ways, it is the greatest star of them all. The Swan Inn is a pub of 1906, built to designs by the architect C T Miles, who had a long-established practice in Bournemouth (in which he was soon joined by his son, S C Miles). The facade would be a fairly standard turn-of-the-century design, were it not for the tile cladding, which covers the entire ground floor level. 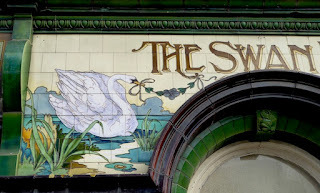 The Swan is one of three surviving late-Victorian tiled pubs in Poole and is the most decorative. That is thanks not just to the strong tiled lettering giving the names of the brewery (Marston’s) and the pub, in brown on a cream background, not just for the two-tone green of the wall tiles, not even for the telling details such as egg and dart moulding or the little dolphin in the keystone of arch, but above all for the pair of beautiful swans to each side of the entrance archway. Each bird’s cloud of plumage floats among lakeside plants and its beak holds one end of a swag, the other end of which is tied to one of the letters of the pub’s name. 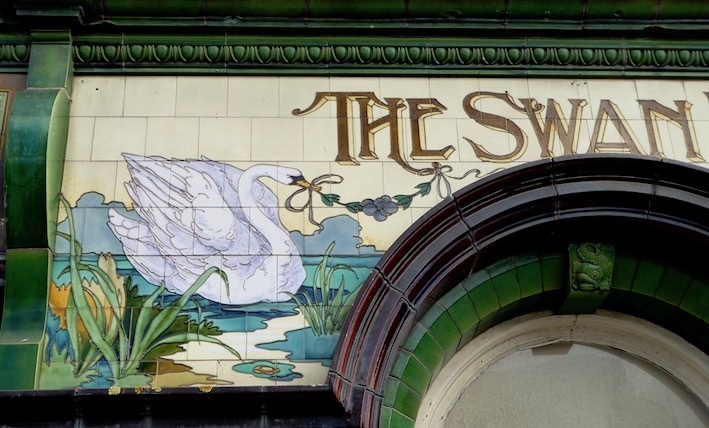 This bit of whimsy links the realistic drawing of the swan and its setting to the graphic world of the lettering. That lettering itself has an element of whimsy – the ornate capitals and overlapping strokes recall the sort Art Nouveau lettering I noticed on another Carter’s panel. This building has been empty for a while. A few years ago a proposal was made to demolish it and redevelop the site, citing a ‘statement of significance’ that declared it to be of ‘little historic or architectural interest’. Fortunately this has been overruled (after objections from the Victorian Society, among others), and the frontage will be retained. The building’s historical value is clear – it’s an outstanding pre-World War I tiled pub facade, a stone’s throw away from the works where the tiles were made. 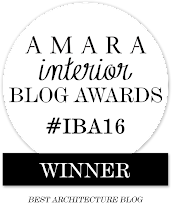 It is also of architectural interest in the way the architecture and ceramics are artfully integrated. You can’t separate the architecture of this period from its decoration. The architectural work of designing spaces, creating plans, and visualising elevations was done, in a building of this type, with the architect collaborating closely with the decorators. The architect, C T Miles, would have liaised closely with Carter’s and their artist over the layout and appearance of the tiles, just as architect George Skipper did with ceramic artist W J Neatby of Doulton when designing the great Royal Arcade in Norwich. That lovely swan means much more here, in the place it was designed for, than it would in a museum. Workers from Carter’s and Poole Pottery must have passed this pub every day, and many of them no doubt drank here. Managers could bring clients here and say, ‘This is the sort of thing we do’. They were probably proud of the examples of their firm’s work that they saw here and on other buildings around Poole. And if they were proud, they were right to be. The third (and final, for now) highlight from my visit to Poole is this panel, one of a pair, that originally came from the shop of W H Yeatman & Sons, corn and seed merchants. Yeatman’s, whose former corn mill I’d noticed when I was walking along Poole Quay earlier in the day, had a shop in the town’s High Street. 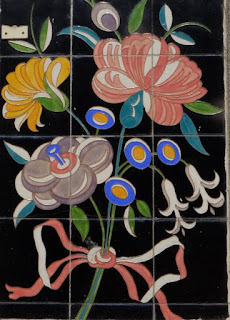 These colourful tile panels decorated the shop from the late-1920s or early-1930s: clearly the owners wanted to remind people they sold more than produce for the farm or vegetable patch. The black background helps the vivid flowers stand out beautifully (there is probably Art Deco influence in this use of black), and the colours are contained within very narrow boundary lines. These were produced using tube-lining, a technique that involves applying wet clay from a syringe, rather in the way that someone icing a cake uses a piping bag. You can feel how the tube lines are raised above the rest of the surface if you run your finger across the tiles. When Poole’s old town was redeveloped in the 1960s, these memorable panels were saved and mounted on the end of a building that is now an ice-cream parlour. Although sited at a road junction with plenty of pavement in front of them, they’re actually quite easy to miss, and I was grateful to have them pointed out to me by Jo, leader of the guided walk that brought them to my attention. * It’s fortunate that this bit of shop ornament, from a time when such decorations were expected to be in place for decades (unlike so many of today’s ephemeral plastic shop signs), were rescued. As well as serving a local business for years, they have now outlived their original raison d’être for even longer. Built to last: modern retailers please note. * Anyone wishing to take part in one of these excellent walks should follow Jo Amey on her Facebook page, The Tile Lady. The page has many pictures of beautiful tiles and she also posts information about the walks there. ‘Now we’re going to go into Halford’s,’ said Jo, leading our surprised group* into a building which was the scene of what seemed to be the last stages of a closing-down sale: the shop is one of those branches of Halford’s that is to cease trading. Diverting our gaze away from the cut-price car accessories, Jo pointed up the stairs, and this panel is what we saw. It is the work of Tony Morris for Carter’s of Poole. 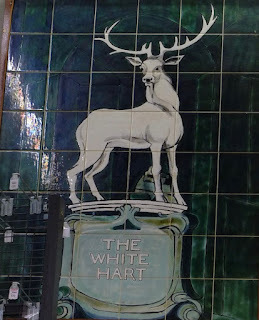 The White Hart Hotel commissioned the sign in the 1960s and when the hotel closed, Halford’s took over the building. Later they moved, and took the finely drawn ceramic stag with them, displaying him in their High Street premises, where he has been delighting people buying car batteries, windscreen wiper blades, and adjustable spanners ever since. For now, though, we were taking advantage of the last chance to see this rare tiled species, staring at us (is he apprehensive, defiant, or just vigilant?) from atop his pedestal. We were assured that the Hart would remain in position when Halford’s move out. One hopes that the new tenants of the building will display this striking piece of ceramic art with pride. * We were on a guided walk. See the previous post for details. One of the tile gems we saw on the walk was this glowing panel bearing Carter’s name. It dates to around 1905 and was originally on a wall of the company’s East Quay works. 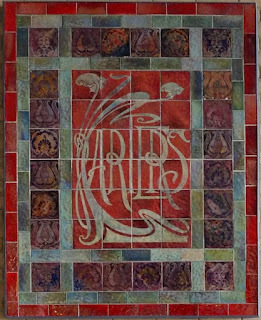 When the works closed and the quayside was redeveloped, several examples of tiling from the old works were displayed on the walls of the new building: this is one of them. It’s prized for its rich reds and its beautiful lustre glazes. A lustre glaze is a metallic glaze that shines with iridescence, an effect produced by metallic oxides. Lustreware was produced in the great civilisations of early Islam, but its most famous exponent in the west was William de Morgan, who revived lustre glazes in the 1870s. 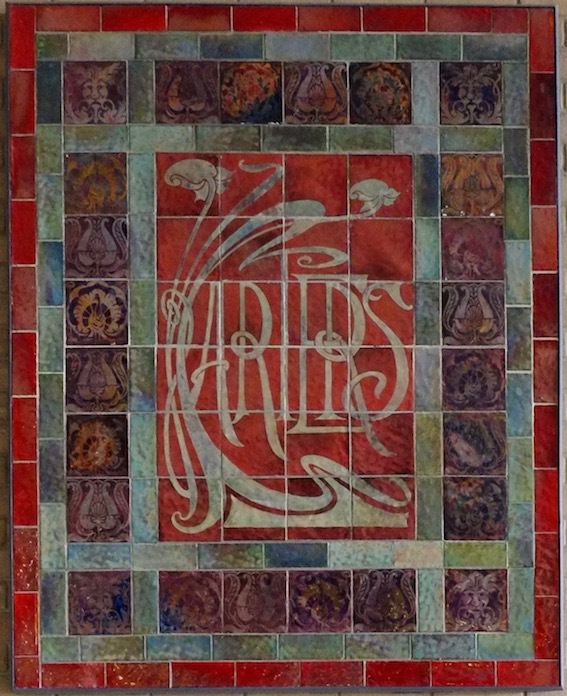 The iridescent tiles in this panel were made under the influence of de Morgan, and they make a sumptuous border for the central area of the imposition, framing the company name. The artful lettering of the Carter’s name is the other reason why I particularly like these tiles. Their expressively curvaceous lines are the essence of the Art Nouveau style, as many readers will recognise. The way the letters are full of curves and loops, the manner in which they break free of the base line, and their habit of overlapping and interlacing – all these are typical of Art Nouveau. But the most typical feature of all is the collection of multiple curves, many doubling back on themselves like waves or whips – hence the term ‘whiplash curve’, by which they’re known. Wherever there is Art Nouveau lettering of the curvaceous kind†, from the posters of Afons Mucha¶ to the early Paris Metro stations, you will find whiplash curves. Now when I do talks and lectures I can show people instantly what architectural Art Nouveau is about. And one couldn’t wish for a more beautiful or memorable way to explain this. * Another reason is Jo’s wealth of knowledge of the subject; I’d advise anyone who might want to go on one of her walks to follow her Facebook page, The Tile Lady . The page has many pictures of beautiful tiles and she posts information about the walks there too. † The other dominant form of Art Nouveau, the style of the Secessionist movement that prevailed in Germany and Central Europe, is much more rectilinear. ¶ Also known as Alphonse Mucha. His many French posters, his long residence in Paris, and this spelling of his name lead many people to assume he was French (or perhaps Belgian). Actually he was born in Moravia, which is part of what is now the Czech Republic. The Northamptonshire town of Brackley is somewhere I’ve visited often, but on my most recent visit I left the town by a route I’d not tried before and soon found myself in Halse, staring at this small corrugated iron church. I knew nothing of its history, but was reminded of others* I’d seen – the Mission Chapel at Halse has an impressive selection of the features – pointed ‘Gothic’ inserts to the rectangular windows, quatrefoil openings, a small spire – that could be fitted to a corrugated iron building in the 19th century to indicate that it was a church. When I got home I looked online, and found the church’s website.† It tells how in 1885 the curate from Brackley had to walk about a mile to Halse to take services in someone’s dining room. 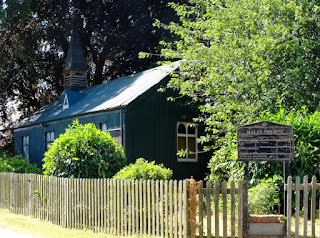 It was thought that the congregation of about 40 people (most of the hamlet’s adult population) deserved a place of worship of their own, and the Earl of Ellesmere bought this building for them in 1900. Apparently he bought it secondhand – it had been a ‘railway community room’ for workers building local railways and had to be taken apart and moved to its present site, demonstrating that these prefabricated buildings are portable and adaptable. One wonders whether the ecclesiastical features were added when it was moved to its current location. The church is still in use and, after a major repair and restoration program in 1999 it looks in good shape – tin churches were not expected to last 100 years. The direction of the very strong sunlight meant I found it hard to take a photograph that does the church full justice (the spire is lurking in the shadows), but I hope the pattern of corrugations, fence uprights, and green leaves is at least pleasant to the eye. * I’ve previously done posts on ‘tin churches’ at Rodley, Coombe Green, Defford and Kilburn, London. 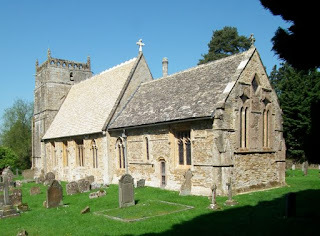 † I am indebted to the website of St Peter’s, Brackley for information about the building’s history. This tile panel is on the side of a building in the centre of Lutterworth. The building is now a coffee shop but was clearly once a pharmacy. The panel combines so many of my interests I couldn’t resist sharing it here. So here are my personal reasons for valuing this obscure bit of tiling, that enlivens a side wall in a backstreet. 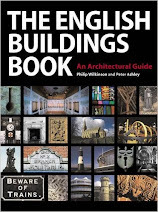 First of all, the way builders and architects have used tiles – to decorate buildings, to form signs, to create wipe-down surfaces, and so on – has been a source of fascination for me for years. Whether it’s a Victorian gents or an underground station, a butcher’s shop or a house, tiles play their role, and bring a bit of colour into our lives in the process. Second, it’s on a shop, and retail architecture, ignored by so many but omnipresent, rich in social history, and central to our daily lives, deserves more attention than it usually gets. I’m often struck by tiles on shops. I don’t just mean the ‘hygienic’ surfaces favoured by food retailers, but also – and especially – the way tiles can be used for display and advertisement: the vigorous and often artfully drawn animalier tiles once beloved of butchers ands fishmongers are a case in point; the tile lettering used by retailers such as Lipton’s is another. Here, the old symbols of the chemist – the flask, pestle and mortar – are given a mid-century modern interpretation. Third is that mid-century modern period itself. The effort that was put into decorating buildings in the 1950s and 1960s, with sculpture, murals, tiles, and sometimes indeed tile murals, is at last getting the attention it deserves. People are still unearthing little known examples and I’m pleased to share this one, which must be well known in Lutterworth but unfamiliar to people elsewhere. * A lot of 1960s architecture was dull, and many people find concrete buildings oppressive and ugly. I don’t,§ but I get even more out of such buildings when they bear this kind of decoration. Fourth, it’s illustration, and as my working life has revolved around illustrated books I’m always interested in the ways artists represent things, even such humble things as a pestle and mortar. I like the way the artist (I’ve no idea who it was, or which company produced the tiles†) has managed to convey the modelling of these objects with just a few strokes of yellow, green and grey, with a swelling of the line here and a diminution there giving some liveliness to the drawing. And although I’m fond of bright colours, I can find something to admire in the restricted palette too, perhaps because it reminds me of the sort of restrictions we faced in the early years of my publishing career, when we often had to get the best out of two-colour printing if the full four colours were too costly. I know that 1960s architecture, and illustrative panels like this, are not to everyone’s taste. Sometimes when I show this sort of thing to audiences of talks or participants on courses, they groan (not always audibly, but one can sense the response! ), as if longing for a decent bit of Georgian elegance. I hope I’ve explained some of the reasons why such things appeal to me. * It doesn’t seem to be in Lynn F Pearson’s admirable Tile Gazetteer, for example. This book is, however, my tile Bible. § And yes, I have lived in one. I also went to school in a Brutalist building, and while I don’t subscribe to the ‘schooldays are the happiest days of your life’ notion, the building was certainly one of the things I did like about school. † The name of the building’s architect, however, is inscribed on the tiles, making me wonder if he designed the tile decoration too. He was Derrick A Knightley, a local man with what sounds like a substantial practice. The date 1961 is also one the tiles. 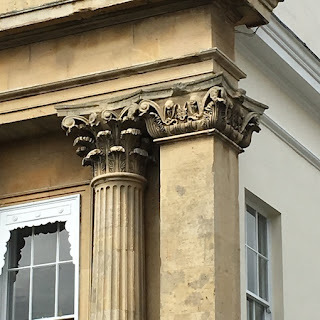 Passing through the area of Cheltenham known as ‘the Suffolks’ the other day, my eye was caught by these capitals. They’re part of one of the town’s most beautiful terraces, which runs along one side of Suffolk Square, itself part of a development on land once owned by the Earl of Suffolk and built in 1832–48. The original architect was local man Edward Jenkins, who probably did the overall design before he left Cheltenham* and was replaced by the more famous J B Papworth. Jenkins included a grand portico-like arrangement of columns and pediments at either end of the row, and the columns are topped by these Corinthian capitals.† I was struck when I looked up how the architect used two variations on the Corinthian design here. There are four round three-quarter columns like the left-hand one in the photograph above, almost free-standing, with a full complement of flutes and the usual Corinthian capital, which has two layers of leaves topped by small scrolls. These are framed by two outer columns, this time square, fluteless, and bearing an abbreviated or truncated version of the capital. This is what you see in the right-hand capital in the photograph, a capital with leaves only at the corners and a strip of egg and dart moulding that fills the space between them. This different design allows the architect to put two columns very close together without the straight repetition of capital design that one sometimes sees. These adapted capitals are a reminder that designers and builders were always coming up with variations on the five ‘classic’ orders. 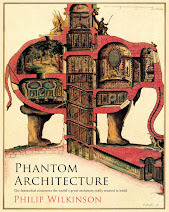 In the past I’ve noted the Borromini order (a sort of upside-down Ionic) in Blandford, a Pergamene order in Clifton, a bird stretching its wings among Corinthian foliage in Birmingham, and the wonderfully eccentric and original ammonite order in Lewes§. Classicism in England is often most interesting when not a straitjacket but a jumping-off point for design, a place for elegant variations within a standard framework of features and proportions. And how well it works. * For more on the circumstances under which Jenkins left his drawing board, see my earlier post on the church he and Papworth designed, which is very near these houses. † Their acanthus leaves and small scrolls make them Corinthian; larger scrolls (like those on Ionic capitals) above the leaves would make them Composite.